Following a screening of the May 6th episode, the audience was treated to a question and answer session with Goldberg, executive producer Doug Robinson, and stars Wendi McLendon-Covey, Jeff Garlin, George Segal, Troy Gentile and Hayley Orrantia. The renewal doesn’t come as a surprise. Though The Goldbergs hasn’t been drawing great numbers, it’s ABC’s fourth-highest rated comedy and has remained fairly steady across the season — even though it’s lead-in Marvel’s Agents of SHIELD has been declining. What do you think? Do you like The Goldbergs? Are you glad to hear that it’s being renewed or do you think it should be cancelled instead? 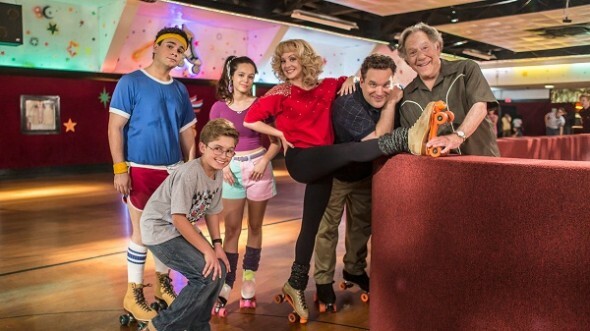 More about: The Goldbergs, The Goldbergs: canceled or renewed? Hilarious! Best show ever so true to its time. lOVE THIS SHOW!! PLEASE DONT EVER CANCEL IT. It’s the Wonder Years of the 80s! We love this show! man, this show bwtter keep going. if it gets cancelled it will be the stupidest decision that the network has ever made. i will negatively promote them! i will boycott them! i will be sure no one ever sees anything they show!! This is one of the best new shows on tv so funny i love it so please bring another season!!!! I love this show. I would be so happy if it was renewed for another season.